It should be difficult for any of us to write about where we grew-up, to write about where we call home, or where we once called home. There are the expected trappings of sentiment and the near constant questioning of ourselves over how things really were. But then similar to telling a story, we might go ahead anyway, accepting the risk. awakening—though perhaps these things were true—but I mean Moab at that time opened another world. My understanding of worlds tells me that there are other worlds to claim, provided another world is found, and Moab was such a world to be found and one that can no longer be claimed. The valley I looked at those years ago is no longer possible to see. That is a plain fact. The valley, as it was then, no longer exists. …there are other worlds to claim, provided another world is found, and Moab was such a world to be found and one that can no longer be claimed. The valley I looked at those years ago is no longer possible to see. That is a plain fact. The valley, as it was then, no longer exists. 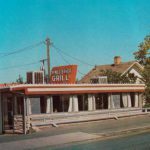 gas stations and a place called the Western Grill or The Westerner. I’m not sure which anymore. 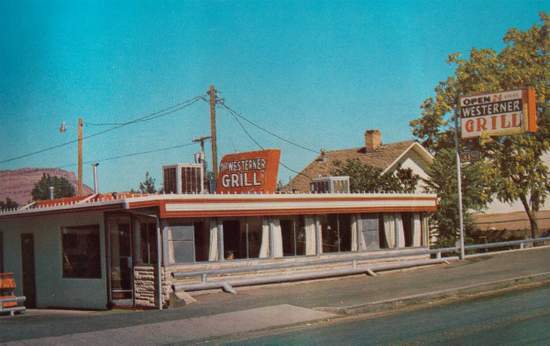 I remember The Westerner because after I got lost the diner was the first place I noticed where maybe I could’ve asked someone for directions. I looked in the front windows and determined this was not a place for a child to ask for anything. Probably someone would have helped me, some cowboy, some rancher, some hand could have given me an idea of where I was and where I was going, but then I didn’t ask. I was, after all, a child. Although I didn’t go into the diner, I told myself that one day I would eat eggs and drink coffee there, and I did, eventually. Otherwise, I went on my way. Texas. In part, the town invited this habit of looking, but maybe we all look more closely at those beginnings and endings that shape us. actualities and things hoped for—some curious mixture of facts and what any of us might wish for when looking back at our lives and where we lived, where we grew up, and where we became what we did or did not become. Moab was that beginning for me, a start into a place now gone. That’s not sentiment either. That’s what William Faulkner might have called “was.” And I like that notion. Moab became my was.